I attempted a job that I have been wanting to do for years... On the nature walk there is a wooden footbridge that I built over 12 years ago that crosses a stream. Underneath the bridge is a lovely old stone tunnel that was the original bridge and was wide enough to take vehicles. 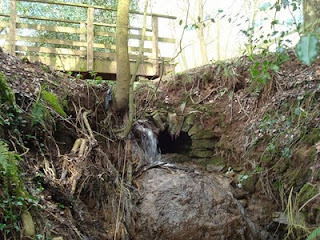 The start of the tunnel I assumed was blocked and the stream had made its own way around but was starting to erode the structure. So I had a dig around to try and find the start of the tunnel. It was a lot longer than I had thought but eventually found the start and tried to open it up. I was hoping that it was just sediment or a log that had blocked it but unfortunately I think the structure has collapsed. I think that it is a very old structure as it is made with stone rather than brick. The local brick kilns were in operation in the early 1800's so I would assume it was made before then. Anyway I have now got the water going through it again which was a very nice sight to see! Spring is here and I am managing to do many of my plans on the farm. I know I keep going on about collecting wood but at present I have probably got about 7 tons back at the farm ready to be chopped and logged etc. This is a very pleasing sight as we are so dependant on wood to keep warm during the winter. The other fact is that the farm is being improved with the tidying up of hedgerows. I have also being 'improving' one of our old orchards. It was quite a sad job as it is a very old orchard which interestingly enough was the spark of how we started making cider over 11 years ago. About three years ago we had some very strong winds and we lost three lovely big apple trees - probably the best we had in the orchard. They were blown over and split the roots which killed them. It was like tidying up a battlefield and I have now removed the remnants including the stumps. It looks so empty now as the trees we have replanted look so very small. Spring has certainly taken hold and the sound of lambs bleating mixed in with birds singing is certainly confirmation. Last weekend was a tasting at The Granary Shop at Weston Park. The park was open for Easter and we were asked to provide tastings of the cider that we sell there. Lovely weather and there appeared to be a good turnout. A lot easier than doing a show for us and I of course enjoy meeting new people. Three other producers were there and I thank them for allowing me to graze their produce for the entire day for sustinence! Thanks also to my great buddies in Newport for entertaining me again for the friday night!